OPTC Guideblog: Special to the Max!! Top 5 Units!! Alvida's Romance has been announced for a re-release! It will last for a week and I want to use this moment (before it's released) to discuss the top 5 units whose special you should MAX. Leveling a unit's special is a tedious and elaborate process that takes a lot of time, effort and luck. However, finally "max-ing" a character's special is an extremely rewarding achievement that can significantly increase the team's strength. The following is a "Top 5" list of the units that specials should be as low as possible to help with both current and future content. These are listed in no particular order (as different player runs different teams and has different needs). It shouldn't be much of a surprise that Mihawk made it on the list. Mihawk's special is considered one of the most sought after/powerful specials in the game. With double Mihawks (or a Mihawk and Whitebeard), players can cut down 51% of any enemies' health without much effort. However, 32 turns is far too long for any normal stage (or Raid Boss). It would take a herculean effort to stall for that long without taking significant damage. As such, lowering the cooldown is essential if you plan on using it. In terms of future content, Mihawk teams has been shown/seen to be able to clear majority of the content including the new (and harder) 0-Stamina Training Forest "Hawk" alongside a library of Raid Bosses. 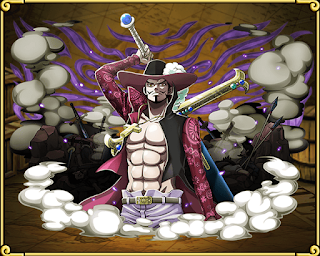 Thus with a powerful special and a long cooldown, Mihawk is one character you want to lower the special cooldown on. 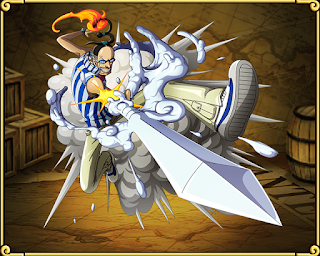 Golden Pound Usopp is considered one of the "must-have" units in the game. It's a "God-Tier" unit that is practically given to every player for free. Players familiar with Usopp knows its power when it comes to guaranteeing/securing victories. While 15 turns may not be hard to stall for, reducing its cooldown will ensure that it is up when you need it and also opens the possibility of firing it off twice in a stage. 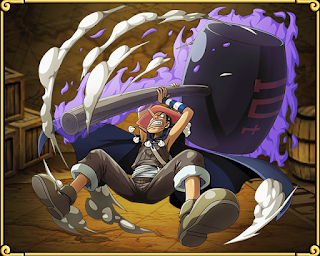 In terms of future content, Usopp is used in a fair few Raid Bosses as well as definite usage in every Training Forest in JPN. It isn't uncommon to see the pre-requisite of these stages read "Max Special Golden Pound Usopp required" either. Thus - Golden Pound Usopp is a unit that is 100% required to be maxed if you plan on clearing the Training Forests. He will definitely find use time and time again. Queen Alvida is one of those units that can find its way onto all sorts of teams. Her damage reduction is currently unmatched (in Global) and the extremely short cooldown (when maxed) means that the possibility of firing it twice a stage or even twice a boss fight is possible. Alvida may not be run much now - but as enemies start hitting harder and harder, she will see a lot more play. In terms of Training Forest, she's often paired with Golden Pound Usopp to survive almost any punishment that can be thrown at them. Having Alvida is essential, but her special is fairly tough to max as her island comes once in a blue moon. Maxing Alvida is a move for the future. 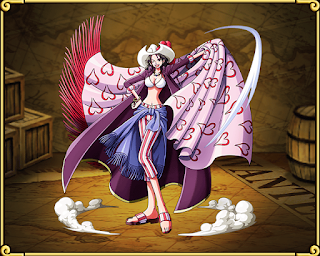 Although the power of her damage reduction should already be proven to be very effective against bosses such as Mihawk and Garp. The only orb-booster in Global at the moment. Coby has been found making a splash in burst teams of other attributes (such as the INT burst team) which speaks volumes for his potential. Coby boosts orb's effectiveness by 1.5x - which is essentially giving everyone (regardless of attribute or typing) an additional attack buff. Burst teams love to finish things fast and are generally squishier than other teams of the same attribute/type. They don't tend to stall well for extended period of time thus leveling Coby is essential. Not just for burst teams but PSY teams as well. While there will be other orb boosters in the future, none of them will really replace Coby except for Doflamingo (who is quite a while off). 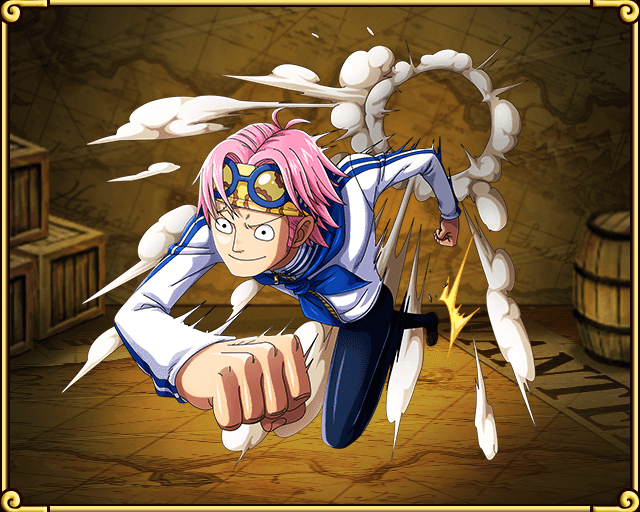 Thus due to his good special and versatility in team choices, Coby is one of those units whose special you should max. To end the list is Mr. 3 - Extra Special Candelabra, While Mr. 3's special is evidently worse than Usopp, putting more utility in Slasher teams is never a bad thing. In fact, Mihawk teams attempting the upcoming Training Forest requires both Mr. 3 and Usopp. Mr. 3 is more useful in some cases due to his capabilities of being a unit that can actually deal damage in the commonly used Slasher team. This is unlike Golden Pound Usopp who is only splashed in purely for his special. If a 1 turn delay is all that's required, Mr. 3 would be used instead of good ol' Usopp. This also applies to INT teams who also are fairly popular in their own right. Thus as a support unit that can be used for offensive purposes, Mr. 3 will likely find a fit in teams here and there. His special is required for Training Forest and is a fairly valuable unit to hold for "now and again". So that's the list of character's specials you should max (or try to), if you only could max some/a few. The characters on this list is listed mainly for Training Forest and Raid Bosses which are the two hardest type of islands in the game. We want to wish you the best of luck farming Alvida books (and Zoro books) in the re-release of the 30-Stamina island!